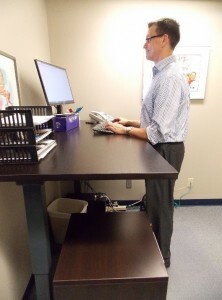 There are lots of things you can do to alleviate the effects of a poor work station or postural challenges. 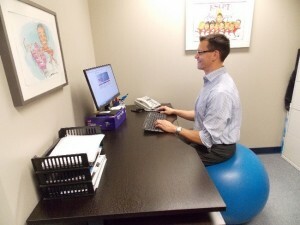 If you have seen one of the team for treatment of neck, shoulder, lower back, or hip pain and spend any time sitting at a desk, you have probably received some education regarding posture. I think good posture starts with your breast bone. Lift it up slightly. This shift will encourage your shoulders to retract, or move backwards, slightly. Focus on closing the gap between the bottom corners of your shoulder blades. Next, tuck your chin down slightly. If you feel like your lower back is swaying forward, lightly tighten your abdominal muscles. There – you’ve done it! Posture your physio would be proud of. Secondly, how are you spending the majority of your day? Are you sitting too much? Most of us are. I recently treated myself with an adjustable work station. This allows me to sit or stand, depending on how my body is feeling. What do you think of my standing desk? What do you think of my posture while sitting on a physio-ball? While this is a nice alternative to a chair, I think it is challenging to spend an entire work day on the ball. Give yourself time to adapt to it as you will be working different muscles than when you sit on a chair. Finally, I encourage everyone to change position every 20 minutes or so. This can be as simple as going for a walk around the office, taking a bathroom break, or re-filling your water bottle. Give your body a chance to recover from static postures and you will be surprised at how different you feel.